Amazon UK has just slashed the price on this little DSLR - and there is £50 cashback too! 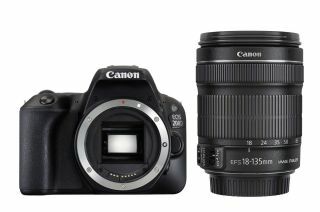 The Canon EOS 200D makes a great cheap DSLR camera for anyone who wants to travel light without compromising on features or image quality. Its 9-point autofocus looks a bit basic by today’s standards, but it comes with Canon’s latest 24-megapixel Dual Pixel CMOS AF sensor, for live view autofocus that’s practically as fast as a mirrorless camera’s. With this particular kit you get the fast-focusing EF-S 18-135mm f/3.5-5.6 IS STM kit lens – which offer much more telephoto power than the 18-55mm lens that usually gets bundled with this camera. It has Bluetooth, Wi-Fi and NFC built in too, so you can transfer photos to your smartphone automatically for sharing on social media, and use your device to control the camera remotely too. Round the back you get a vari-angle touchscreen LCD – that makes it easy to get over-the-shoulders or ground-level shots without breaking your back; and it is helpful for selfies and video vlogging too!